If you need a quality EZ Pass Holder that fits a variety of transponder sizes and shapes, the JL Safety Pass Port makes a great option. 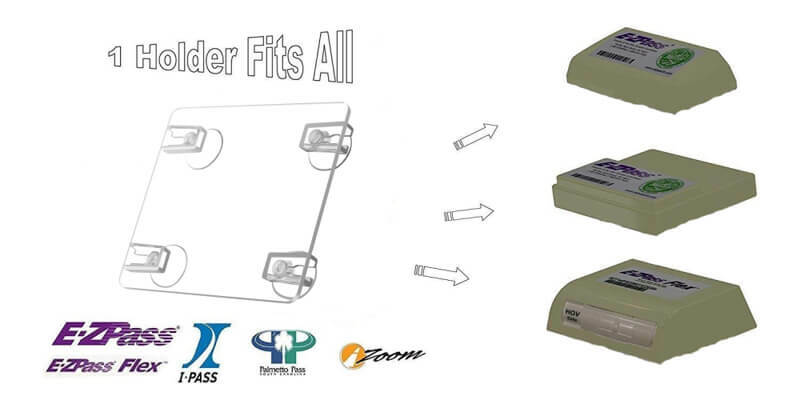 The pass port holder offers compatibility with a wide range of toll transponders including: the old and new EZ Pass, I Pass, I Zoom, PalPass hard case and FasTrak. Made from steel, so it won’t melt, break, or deform. Industrial grade suction cups for all conditions. No adhesive is required, making it easy to install. It doesn’t deform, bend, or lose its color after multiple uses. If your tired of the boring and generic EZ Pass holder designs, consider this option. This holder includes a bright paw shaped logo. In addition to the unique design, this choice includes an easy to attach, suction cup design. The holder also includes an easy to release tab to easily move your toll transponder between cars. Perfect for dog owners with a unique paw shaped logo. Fits all new toll transponders from each of the major programs. For an easy to use option, the Toll Tag Holder represents a great choice. The Toll Tag holds your EZ Pass, i-Pass, or i-Zoom. Just slip your transponder into the mount and use the two suction cups to easily mount it into your windshield. The suction cup design allows for easy removal, making it ideal for someone who changes cars often. Easy to put on with no adhesive required. The EZ Mount is easily removed for either changing vehicles or cleaning purposes. The large suction cups hold it securely in place for optimal use. This toll pass holder is easy to use and perfect for drivers with multiple cars. It is a slim pocket design that allows for easy removal for your EZ Pass. It is made for the new size transponders, which means it is smaller in size. Three suction cups to mount to your windshield, which provides a more secure hold. The pocket allows for easy removal to prevent theft and make it easy to use in other vehicles. Designed to be used with the new size transponders. Comes in a sleek black finish. For an EZ Pass holder with a little flair, consider this option. This EZ Pass holder fits all major toll pass transponders and includes a bright and colorful US flag design. The easy suction cup design includes release tabs for a quick and painless removal from the windshield. Great option for drivers that want to add a little personality to their cars. Holds all of the new toll pass transponders. Easily attached and released with special release tabs. Includes a decorative sticker to personalize your holder. The EZ Pass clip electronic holder is a toll tag holder for the three different kinds of transponders—EZ Pass, i-Zoom, and i-Pass. This neat little design allows you to slip in your transponder and clip it for a secure hold. It is a perfect fit for several states’ transponders. Allows you to mount it without permanent Velcro strips. The suction cups allow for easy mounting and removal. Designed with lightweight UV resistant ABS plastic. Perfect for use in multiple vehicles. The Toll Transponder is designed for the new, smaller size EZ Pass and I-Pass transponders. The solid design is intended to remain secure in your vehicle with temperatures up to 200 degrees. The design includes 3 suction cups for a secure and stable fit with your car’s windshield. Sleek black finish to match any vehicle or interior. The secure three-point mount allows for easy mounting and easy removal. Made for the new, smaller sized transponders. Does not fit the old, larger transponders.